We hope you were inspired by our Women in Science! 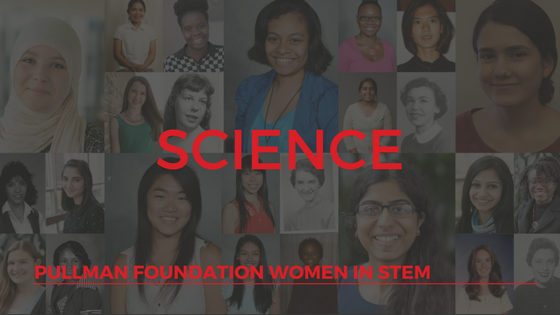 We only featured three of our amazing 30 female scholars majoring in a science field, so we can only imagine what others are learning and experimenting on in their classes. If you are interested in pursuing a career in science or would like to get more involved with science programs, take a look at the organizations listed below. Mentioned by Jennifer, Science Olympiad is a nationwide science competition for middle to high school students. Each year, a portion of the events are rotated to reflect the ever-changing nature of genetics, earth science, chemistry, anatomy, physics, geology, mechanical engineering and technology. Through Science Olympiad, students, teachers, parents, principals and business leaders bond together and work toward a shared goal. Founded in 1971, the Association for Women in Science (AWIS) is the largest multi-disciplinary organization for women in STEM. They are dedicated to driving excellence in STEM by achieving equity and full participation of women in all disciplines and across all employment sectors. Membership is open to any individual who supports the vision and mission of AWIS. Their website has job opportunities, research and analysis, career development tools, advocacy tools, and options to join or gifting memberships. They are committed to promoting the work of women and minority scientists at every stage of their academic and professional careers in order to encourage an increase of diversity in the workforce and allow for further creativity and innovation in the sciences. The FMWIS is open to everyone; anyone can apply and all are encouraged, whether you are a Field Museum staff member or volunteer, member of the community, student, or merely interested in hearing more about how you can help and become involved as a member. Membership is free! Founded by Pullman Scholar Alumnus Marcus Woods, the Woods Educational Enrichment Foundation provides tutoring and a STEM Development Seminar for high school students. Contact them if interested in more information, need tutoring or would like to be a tutor. If you know or are a part of other notable organizations, please contact Katie Desir.